Sniper has long been a very popular feature of TradeSkillMaster, with many goblins even setting up a second, dedicated sniper account. 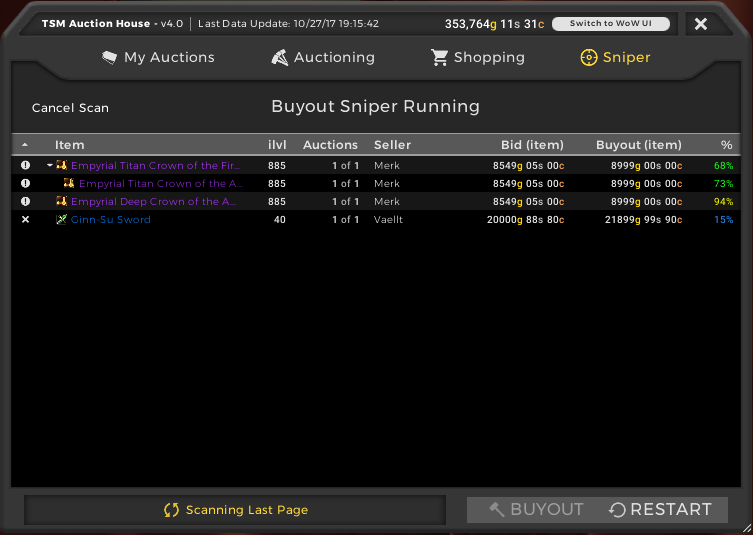 The Sniper feature allows for snatching up deals as quickly as possible once they are posted on the auction house by constantly scanning the most recently-posted auctions and comparing the buyout price with user-configured maximum prices at either a global or operation level. In TSM4, we’re making Sniper a first class feature by adding new Sniper operations and a top-level Sniper tab to the Auction House frame. We’re also adding an entirely new type of sniping in the form of a new Bid Sniper. In TSM3, Sniper configuration is done at either a global level or within Shopping operations. 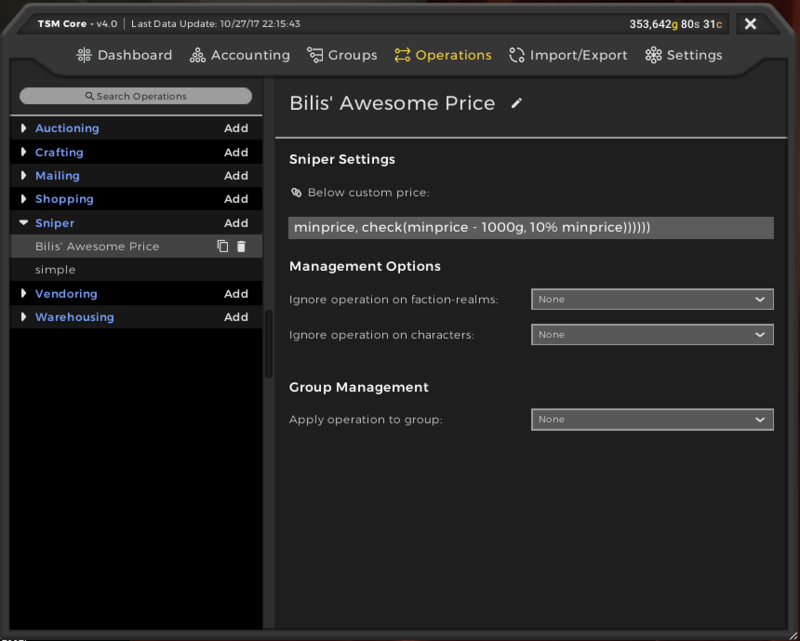 Our reason for putting the configuration in Shopping operations in TSM3 was that we felt users would likely have the same max price for Shopping as they would for Sniper. However, this has traditionally led to some confusion, and is a bit limiting. Now that Sniper is a first class feature, we’ve created an entirely new type of operation for Sniper. As shown by the screenshot above, there is just a single “Below custom price” option for specifying your max price while sniping within Sniper operations. This max price will apply to any items within groups with this operation applied, or, if you have a Sniper operation applied to the new Base Group, it’ll apply to any items which aren’t in any group at all. TSM4 will ship with a default Sniper operation which will come pre-loaded and applied to the Base Group to allow new users to take advantage of the Sniper feature immediately upon installing TSM4. Upon switching to the new Sniper tab in the TSM4 Auction House UI, you’ll be prompted with the option of starting either a Bid Sniper or Buyout Sniper. 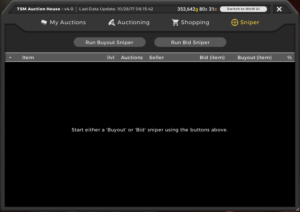 The Bid Sniper is a new type of sniper which, instead of looking for recently posted auctions, looks for auctions which are about to expire which have a bid price below the max price you have set in your Sniper operation. If you click on the “Run Buyout Sniper” button, the Buyout Sniper scan will start. There are a ton of new features in the TSM4 Sniper. For example, the progress indicator at the bottom will animate to indicate that the scan is in progress. One common issue people run into with Sniper is phasing. This is a bug on Blizzard’s end where the AH freezes when you phase between servers without giving any indication of what has happened. TSM4 is able to detect this and will warn you when it happens so you can re-open the AH to resume your scan. Also, the results are now sorted by how recently they were posted so the newest results will always be on the top, ready for you to buy as quickly as possible. One common piece of feedback we’ve gotten from users is that some items show up in the results which they don’t want to buy, so in TSM4, we’ve added an easy way to clear an entry from the results table as well as a way to quickly restart the scan to clear all the results. As you can see, Sniper is better than ever in TSM4 and we’re super excited for you to try it out for yourself. If you want to ensure you get into the beta as soon as possible, you can go ahead and sign up for an invite here. If you like what we do and want to support the continued development of TradeSkillMaster and also get priority access to all of our betas, please consider becoming a TSM Premium user. Looks awesome I cant wait.